As much as I love meat kebabs, I wanted a veggie version too. This is what ‘hara bhara’ kebabs are. Pronounced ‘hurra burra’. ‘Hara’ means green, and ‘bhara’ means ‘full’. In other words, they’re kebabs that are full of greens. 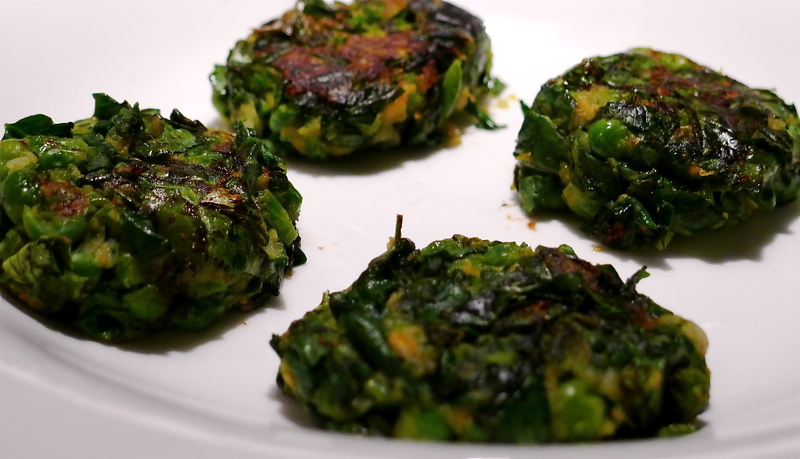 Not only are the spinach and peas good for you, but the spicy potato mixture that forms the basis of the kebabs gives it a real kick. Don’t think for a minute that these are bland or boring. Would I do that to you? In a large bowl or pot, mash the potato with a fork until relatively smooth. 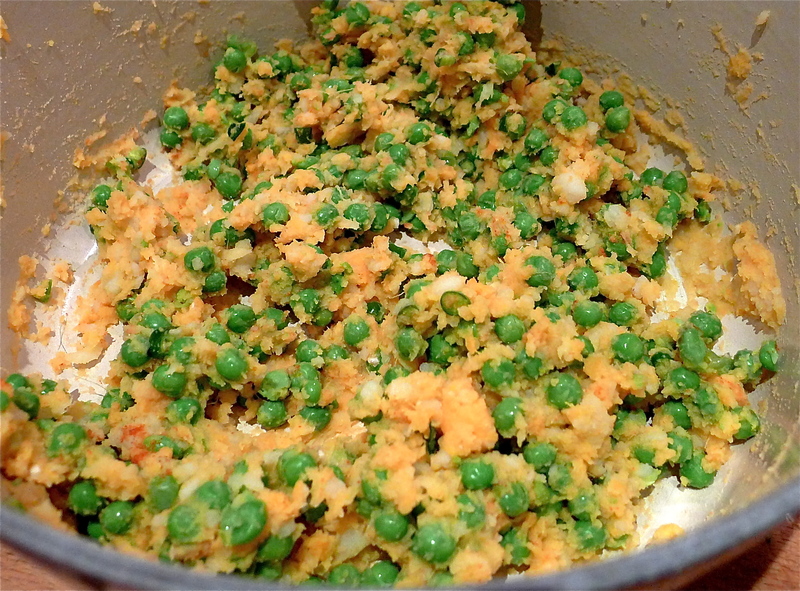 Add the salt, chilli powder, ginger, green chillies, coriander and peas. Mix through. It’s very important that everything you add to the potatoes has had any excess moisture removed. So the ginger should be squeezed, the peas and spinach should be drained. Too much moisture will make the mixture fall apart when you fry it. Add the spinach and mix through again. Now add the breadcrumbs to firm it up. Shape and fry one kebab – about 6 cms in diameter and about 2 cms thick. 5 minutes on each side should do it on a low heat. The kebab should be golden brown. Taste it. Then tweak your remaining mixture. More salt? More chilli? Flour your hands, shape the mixture into patties and place in the fridge for at least 30 minutes to firm up. It makes it less likely the kebabs will fall apart in the pan. When you’re ready, fry them in batches in a tablespoon of oil, gently turning them over after 5 minutes. I cannot stress enough how important it is to ensure you don’t add lots of moisture into the mix. It makes the kebabs go a bit soggy and they can fall apart. So make sure the peas and spinach are well-drained, and that once you’ve grated the ginger, you squeeze most of the liquid out of it. You could use half white potatoes and half sweet potatoes as a variation..